Published Jul 24, 2018 By Julia Leave a CommentThis post may contain affiliate links. 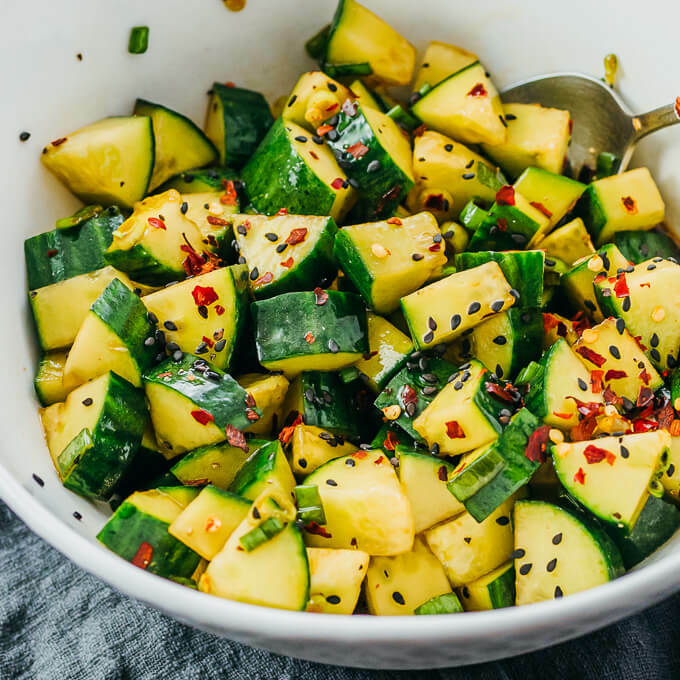 A simple recipe for spicy Asian cucumber salad with green onions, tossed in a soy sauce and sesame oil dressing. Low carb, keto, gluten free, and vegan. This is one of my favorite Asian salads — light, refreshing, and simple. 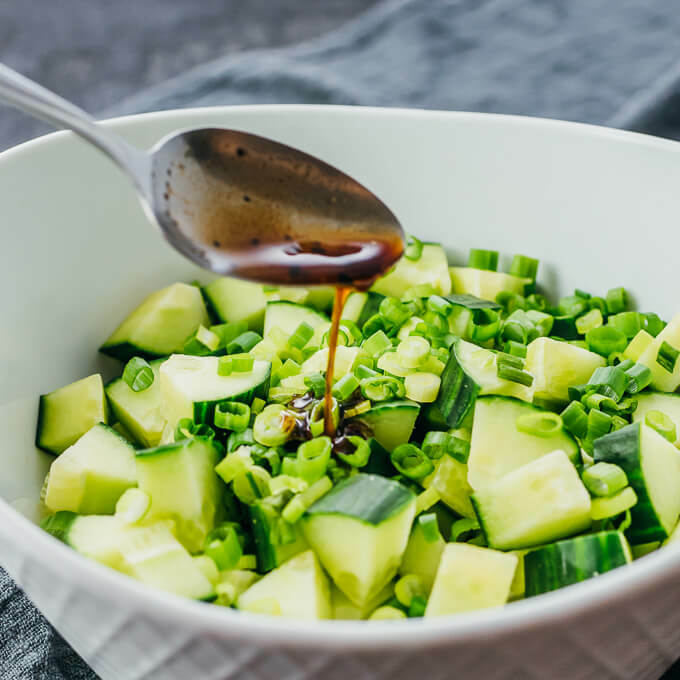 Chopped cucumbers and sliced scallions are combined with a savory dressing of soy sauce, sesame oil, vinegar, sesame seeds, and crushed red pepper flakes. 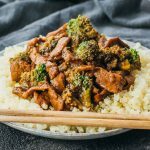 You might have had similar versions served in Chinese, Thai, Korean, or Japanese restaurants. The cucumbers are juicy and crunchy, with a spicy tang thanks to the dressing. I think it gets better with time, so I usually let the cucumbers soak in the dressing for at least thirty minutes before tossing again. 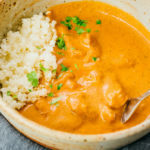 This is a pretty forgiving recipe, and you don’t need to use the exact ingredients or precise amounts. You can even add ingredients to taste until the dressing is perfect for you. 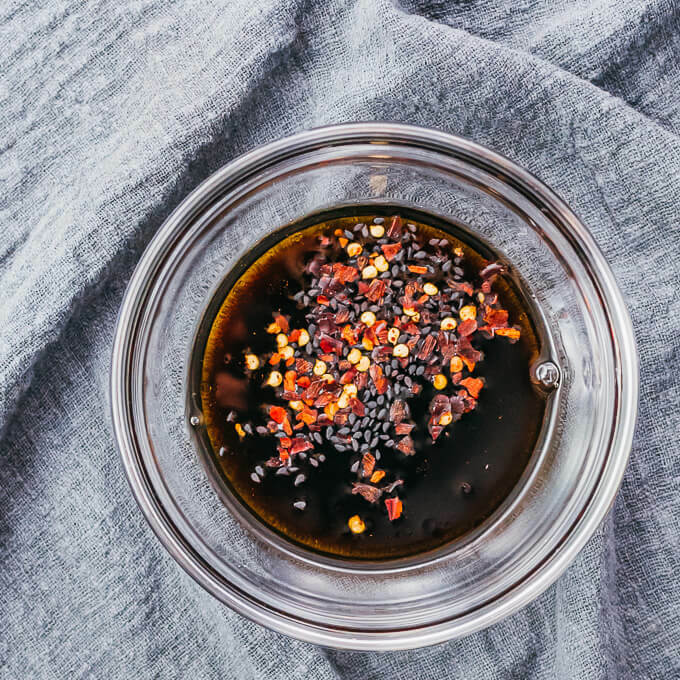 This is especially true for crushed red pepper; you’ll want to add that until the dressing reaches your desired spiciness. The same goes for salt and pepper. 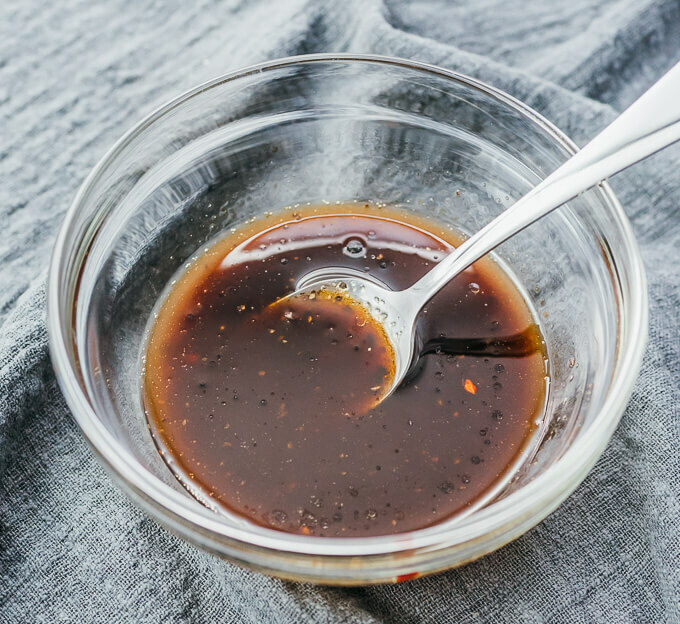 I recommend using low or reduced sodium soy sauce — note that this is different from “light soy sauce” — so that you can adjust the saltiness of the dressing. Otherwise, it could be very salty. Any kind of cucumber variety will work for this recipe. I usually use one large English or Japanese cucumber that’s a little less than one pound. If you use smaller ones like Persian cucumbers, you may need to use two of them. I usually use seedless cucumbers, but seeded ones will work as well. 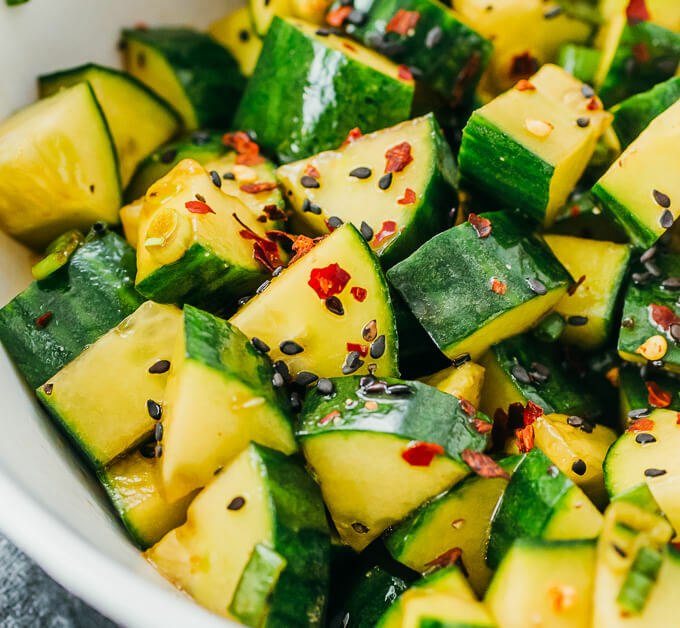 This recipe makes a generous amount of dressing, so mix well with the cucumbers to ensure they’re well coated. 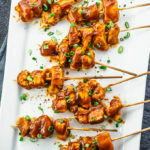 Once the cucumbers and scallions are tossed with the dressing, let them marinate in the refrigerator for about thirty minutes so the flavors can soak in. 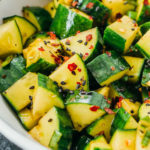 But don’t wait too long to serve this salad, as the cucumbers lose their crunch over time and the dressing will turn more watery when the cucumbers exude liquid. Even then, I still think it’s quite good, but some people might not like the texture as much. Slice the cucumber into coins, then cut each coin into small wedges. Thinly slice scallions. Set aside. In a small bowl, combine all dressing ingredients. Stir until well-mixed. Add salt and pepper to taste. In a large bowl, toss cucumbers and scallions with the dressing. Taste and add more crushed red pepper if desired. Refrigerate the cucumber salad for 30 minutes to chill and let the flavors combine. Then toss the salad again with the dressing accumulated at the bottom of the bowl, and serve while cold. 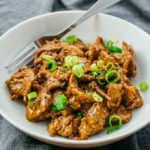 This recipe yields 7.5 g net carbs per serving (1 salad or 1/2 of recipe).